I short while ago, I shared some communications with a farmer regarding neonicotinoids and bees. Because I am a campaigner for bees, it may be easy to assume I am against farmers generally, but this really is not the case. I see farmers as doing their best to grow food for the people. Alright, you may be able to point out rogue farmers, farmers who don’t care (about the environment, livestock etc, etc), but I believe there are many farmers who do care. I also think that with regard to agro-chemicals, most farmers receive limited information, or information from a biased source. They often have to rely on government departments to do their jobs properly, in order that they may do theirs – this includes the regulation of agro-chemicals. Farmers are under pressure to produce food as cheaply as possible, and while things are tough for many smaller and medium-sized farmers, the wealthy barley barons enjoy fat government/EU subsidies courtesy of the tax payer. And of course, farmers need bees and other pollinators. I had the pleasure of journeying to a very pretty part of Norfolk, England during late Summer this year, and this being the first time in several years that I have spent more than a day or two around an arable/food crop farming area, I was truly delighted to see the scale of some of the wildflower pollinator strips by fields. They were fantastic! I had expected a mean little margin. What I saw was a motorway (or ‘highway’ if you like) of wildflowers! Some time later, I found myself in communication directly with a farmer. It was interesting to gain an overview of his beliefs regarding neonicotinoids and bees. I endeavoured to put him in the picture, but will he take notice? Perhaps yes or no – or perhaps if not now, maybe in the future. Our correspondence was polite at all times, and I hope friendly and co-operative. At the end of the day, I saw that his reasoning genuinely was that neonicotinoids have replaced a chemical which is more toxic for bees. Hence, he thought that in his own way, he was doing his bit to help! I thought I would share the farmer’s assertions, along with my feedback. "The contention is, that seven months after planting there is enough power left in the neonicotinoid seed dressing to seriously damage a very large robust bee that settles on the flowers. This conclusion was reached because bees exposed to massive concentrations of neonicotinoids in a lab behaved in a way that lead to death by other means. The only insects that die, are those that eat the plant or the seed. If I am exposed to the alcohol in a pint of beer, I am unharmed. If I am exposed to a pint of alcohol then I am in trouble. Such was the logic of the neonicotinoid ban that was rushed through Brussels without the benefit of field scale trials last year." There have been many field trials (significantly more robust than the industry trials). These, along with others, form part of a review of 800 papers by an international body, the IUCN. It has been proven, including in field trials, that neonicotinoids contaminate nectar and pollen at levels toxic for bees. 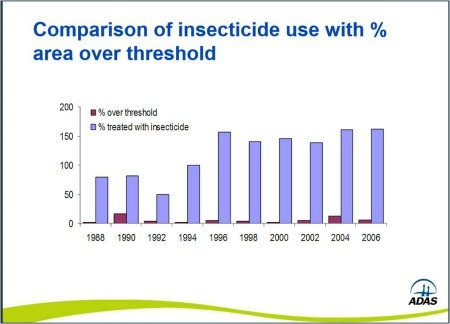 Bayer Cropscience state that their neonicotinoid Imidacloprid has lasting potency – in other words, it remains toxic for years – certainly it can offer protection from termites for upto 5 years. In addition to which, let's not forget the importance of sub-lethal and chronic effects. Tiny doses may hamper performance of the insect, and making it more susceptible to disease, ultimately resulting in its demise. Again, this has been proven in scientific studies (examples here and here). In addition, various sources, including from DEFRA, indicate worrying levels of persistence in soil, and contamination of areas not intended for treatment, such as field margins, water courses - and neonics are mobile in ground water. The failing of the EU is not that they imposed a ban at all, but that it was completely inadequate, no surprise given the industry lobbying and threats. Were you aware that even the Dutch parliament voted to ban neonicotinoids, but the government responded saying they could not go beyond the EU ruling? "The quantity of the active ingredient is severely limited by the tiny surface area of the seed and the relatively low number of seeds planted on an acre. The seeds are drilled in rows about 5” apart, leaving the great majority of the field untouched." Field studies reveal contamination of field margins and guttation. According to Bayer’s own research, about 90% of neonicotinoid actually ends up in the environment, which of course is needless environmental contamination. Bayer Cropscience also admit their product leaches beyond the treated zone (they call this ‘lateral soil movement’). READ MORE HERE. "There is an interval of 8 months between the application of the insecticide and the arrival of a bee." But this is inconsequential because for the reasons outlined above. "Agronomists are genuine professionals who challenge each other with crop-risk v environment-risk arguments." This may or may not be the case, but at the end of the day, they are also paid commission on sales of agro-chemical products sold to farmers. I also wonder why it is that farmers use chemicals even when ‘pest levels’ do not reach a level deemed necessary for using chemicals. As an aside, I am, however, concerned about other insecticides too – bees are insects after all. But if the chart above is true, it suggests farmers need better, more honest information about the real need for applying poison to their land. I’m not convinced they are currently getting it. At the end of the day, I believe we have to find better solutions to enable us to produce food and feed the people. We could start by not wasting so much and distributing it better. We cannot simply go on poisoning the planet and the creatures it sustains. If we try, it will harm the beautiful eco-system beyond repair, and this will ultimately be to the detriment of humanity too.